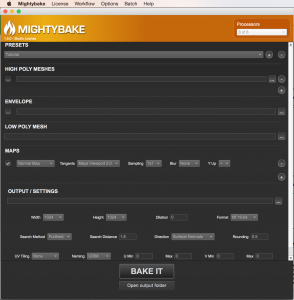 Once you have installed MightyBake, what next? Well this tutorial can help. It will explain how to get a basic bake set up with a single map and a high poly transfer to a low poly object. If you are using Maya, please see this tutorial to setup your shelf. MightyBake can do two styles of baking. Transfer Baking – It can transfer attributes such as normal or vertex colour from a high poly object to a low poly object’s UV space and produce a texture map that can be applied to the low poly object. We often call this “High to Low Baking”. 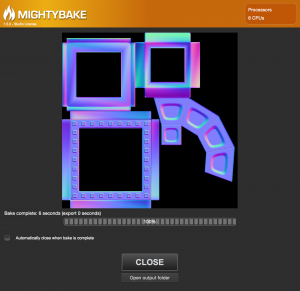 Single Mesh Baking – MightyBake can also bake the attributes of a single mesh to a texture in that mesh’s UV space. We sometimes call this “Low to Low Baking”. For some people their ‘low poly model’ may not actually be very low. In this tutorial we will cover Transfer Baking (High to Low). Single Mesh Baking is done simply by turning off any High Poly models for the bake, but we will cover that in more detail in another tutorial. Let’s take a quick look at each of the elements. Processors – You can control the amount of processors used in your bake. Keep this at the maximum for the fastest bake or reduce it if you want to save CPU resources. High Poly Mesh – For transfer baking, you can add any meshes you want to capture in your baked textures map. You can add as many as you wish. You can individually enable them each other the checkbox to the left. 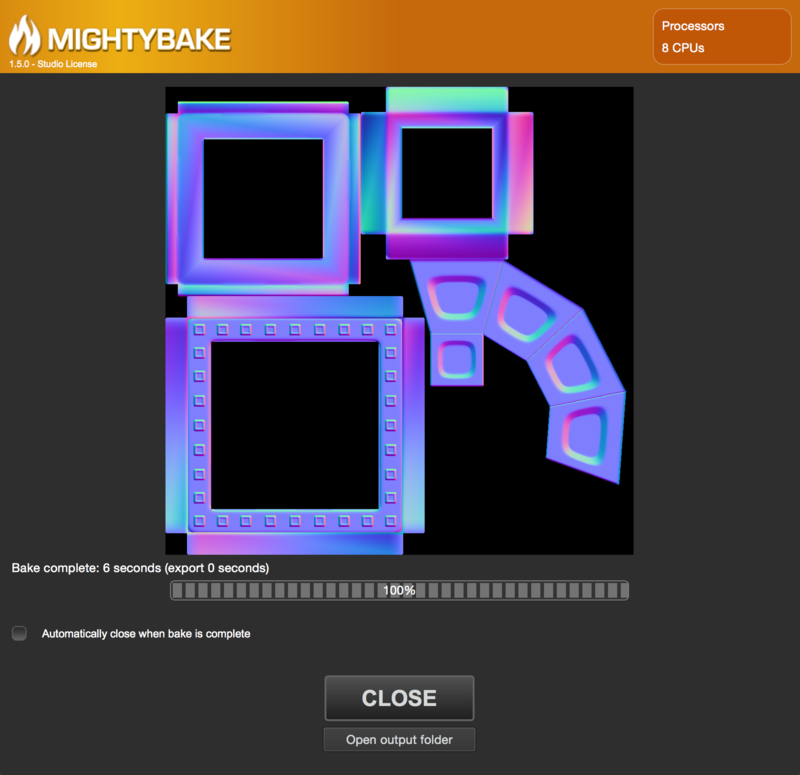 MightyBake currently supports FBX and OBJ files. Envelope – This is an option file used during transfer bakes that will contain the transfer from reaching too far. You can use it inside concave areas of your low poly mesh to make sure that the transfer doesn’t grab surfaces it shouldn’t. You can enable and disable this file with the checkbox to the left. Low Poly Mesh – This is your target mesh for baking. It is used to define the UV space for both transfer baking and single mesh baking. Fill this in with the mesh you ultimately want to display your map on. Maps – The meat of the baking process. Here you can add any maps you want to bake for this model. Each map has its own options. You can add and remove maps using the plus and minus buttons to the right. After a map has been added, you can enable and disable it with the checkbox to the left. Output – Here, you define how you want all the output textures to be processed. You can specify format, size, post processing and their output location. 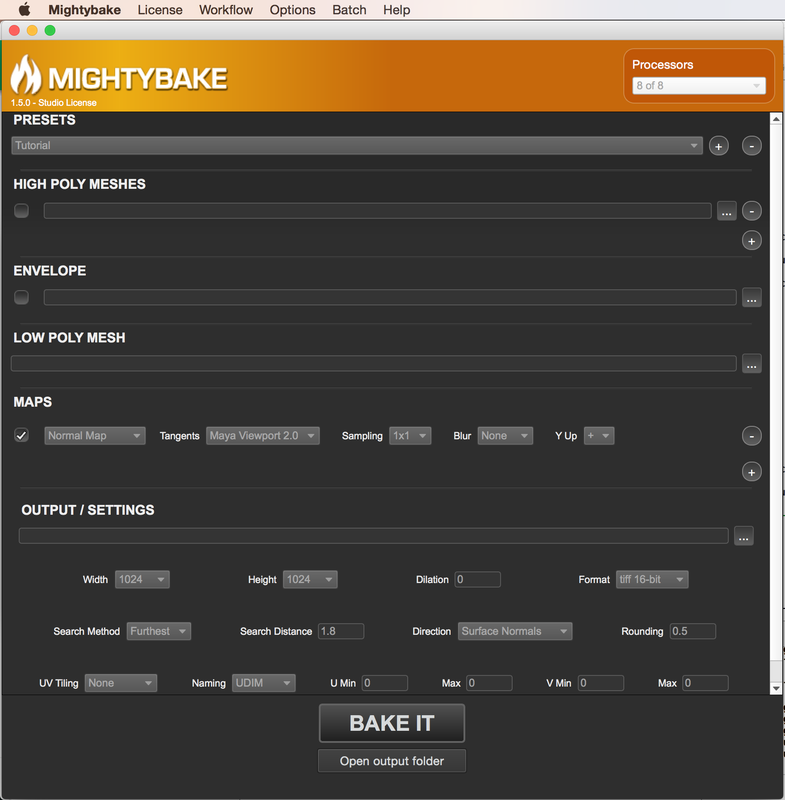 Bake Button – Once you have set up your bake, click this button to start. The render window will come up when you bake. That’s it for the UI. Let’s take a look at the baking process. Baking a normal map takes the normals on a high polygon mesh and then captures them in a texture map for use on a low polygon mesh in a specific engine. MightyBake makes this process easy. All you need is a high poly mesh and a low poly mesh. This tutorial doesn’t cover using an envelope mesh. In the first field “High Poly Meshes”, browse to an FBX file that you want to capture the normals from. Choose your target tangent basis from the dropdown. Browse in the output area for a target base filename. The postfix “tnm.tif” and “onm.tif” will be appended onto the filename you specify for the tangent normal map and object normal map respectively. Click the open output folder to find the newly generated maps.